In a moving vehicle or on any moving machinery it is often useful to be able to take evasive action when the vehicle collides with an object. Naturally the action required is down to the vehicle’s stopping distance – a car travelling at 60mph would need very sophisticated radar to be of any practical use! However a vehicle travelling at, say, 4mph may be able to stop sensibly within 10cm or so. The safe stopping distance is down to the vehicle’s mass and speed and the load it is carrying and is therefore not something that we can completely control in the electronics. However reversing controllers (such as DNO, Pro and the 4QD series) all have ‘dual ramp’ reversing. This means that, if the reverse switch is operated at speed the controller will automatically slow to zero speed (under control of the deceleration ramp), reverse and then start up again backwards. This means that if you have a sprung bumper at the front of the vehicle and place an auxiliary reversing switch so that it is operated when the springs of the bumper start to compress, the controller will go into reverse, slow down then back off until the switch opens again. The vehicle will now ‘hover’ at the switch’s operating point. Naturally for complete safety the bumper’s free travel should be greater than the vehicle’s stopping distance or crushing would occur during braking. The ‘bumper’ switch can just as easily be the top an bottom limits on, for instance, a lifting platform. Left is a suitable circuit showing how to use two switches, one at front and one at rear for ‘both end’ collision detection. S1 is the normal forward/reverse switch. S2 stops forward motion by applying a reverse input when closed and S3 stops reverse motion by inhibiting forward movement. With this system, if you drive into an end stop, the machine will hit the end stop and change direction, backing off the limit switch. When it releases the end switch it will change direction again, operating the limit switch. So the machine will hover at the point of operation of the switch a long as and movement (demand) speed is present. This system will work with any 4QD reversing controller. When using 4QD’s joystick board or a DMR with the DNO, a slightly different arrangement is required. The second diagram shows the direction output of the JSB (an NPN transistor with a pull-up resistor to +24v (or +12v) and the direction input to the VTX which senses at about 6v. The VTX’s direction input is high to engage reverse. 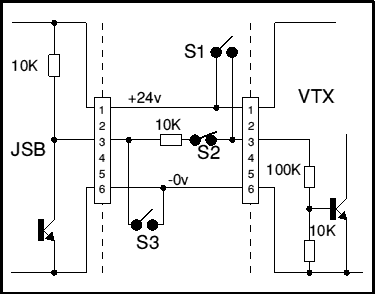 If S1 is closed, the VTX will always go in reverse, so if this is closed by forward travel, the machine will hit the switch, stop, reverse and back off to the switch’s operating point where it will hover until the joystick is reversed. The extra 10K stops S1 ‘fighting’ the JSB’s output transistor. The ‘daughter’ version of the joystick interface (JSD-001) has connectors for such switches. Similarly if S3 is closed, then the DNO will always travel forward. Alternatively S2 can be fitted. When this is open the joystick can never give a reverse signal to the VTX. Naturally in a machine you must consider what will happen if both end stops get operated simultaneously or if one switch sticks. In the the second diagram, S1 will always win. Note that the daughter version of the Joystick interface has this end stop circuitry included. An alternative scheme is also possible with some controllers. The DNO series have ignition and reverse inputs that can be used as ‘go forward’ and ‘go reverse’ inputs. Used thus, a pot is connected and left set to the required speed and the two ‘go’ inputs are then used to enable motion. Clearly you can’t easily do this on a controller with high pedal lockout fitted, but the VTX series do not have HPLO. See also an application note for the 4QD series controllers. With these ‘go’ inputs, simply fit normally closed switches in series with the two go buttons so that the switch that opens for forward travel limit is in series with the ‘go forward’ input, This will stop the forward motion whilst still allowing the reverse input to be used. The subject of end limits on machinery is clearly related, but can get a lot more complicated than you may expect. What do you really need the machine to do when it reaches the limit? Why has it reached the limit? It’s a large subject on which a surprising amount can be written!